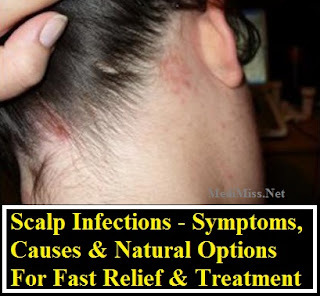 There are many definitions and symptoms commonly described as "scalp infections". There are in fact quite a few quite different reasons why your scalp may be sore, itchy, inflamed burning red or infected. If you are like many people with chronic scalp issues - it may be driving you completely up the wall and not knowing what it is or how to treat the problem effectively after many unsuccessful attempts to eliminate it can make it seem far worse - like you are never going to get to the bottom of the problem. Well that need no longer be so! It can be simple to diagnose and treat it now and for good. So if you are dealing with any of these symptoms lets first identify the problem and then some of the underlying causes. Red burning itchy scalp can be characterized as any tingling,burning, prickly, and sensitive to the touch or a fiery hot sensation. Often associated with an allergy, sunburn, chemical burn (sensitization of the scalp),or fungal infection. Dandruff as most of us know is the process of continual shedding of skin cells on our scalps. Often the cause of dandruff is simply the result of toxins, pollutants and products that have built up on the scalp particularly products like silicone- a cheap commonly used artificial shine enhancer in conditioners sold in supermarkets. When the natural balance of our scalps is disturbed, this creates the perfect environment for the yeast fungus Melassezia Globbosa to move in and thrive. This is when the natural process of shedding our cells gets a little out of hand resulting in an unsightly condition known as "Seborrhoeic Dermatitis" (fancy name for dandruff) and we see the highly visible tell-tale signs of flaking and crusting. The accompanying itch and urge to scratch are often made worse by the multiplication of the fungal yeast pityrosporum-ovale (having one big party on your scalp). Another follow on effect of this is that the relentless scratching by the sufferer can cause small lesions which weep and ooze or become infected resulting in scalp infections. Lumps bumps and sores are also common when the scalp is highly irritated or sensitivity has been aggravated. Candida can be an underlying cause of yeast infections of the scalp. Ringworm of the scalp (tinea capitols) is a superficial fungal infection of the scalp. Scalp ringworm is caused by mold-like fungi called dermatophytes. Ringworm infection occurs when a particular type of fungus grows and multiplies anywhere on your skin, scalp, or nails. It is far more common in children and symptoms include red, itchy patches on the scalp, leaving bald areas. The skin might itch and be red and peel or be scaly, have swollen blisters or a rash (that can spread) and looks like black dots. The rash is highly contagious. It is normally treated with over the counter products containing miconazole, clotrimazole, or similar. Sometimes prescription anti fungal skin medications, such as ketoconazole are needed to clear it up. There are also products direct from nature's factories that can aid the healing process and act as natural antibiotics, although it must be said that ringworm is an aggressive fungus which needs to be monitored closely and treated accordingly. Dry scalp can feel "tight", a sensation that is sometimes accompanied by flakiness. It is often the result of natural oils being stripped from our scalps by the frequent use of shampoos, hair dyes and or other hair products. Dermatitis of the scalp (Seborrheic dermatitis) is an inflammatory disorder affecting areas of the head and body where sebaceous glands are most prominent. It can vary from mild dandruff to dense flakey and greasy scale. Once again it is often an accumulation of toxins and products built up on our scalps that our body is trying to rid itself of. Eczema of the scalp similar in appearance to Seborrheic dermatitis but instead has the name Atopic dermatitis. Scalp Psoriasis commonly occurs on the back of the head however multiple areas of the scalp or the whole scalp may be affected. Scalp psoriasis is characterized by thick silvery white scales on patches of very red skin and can extend slightly beyond the hairline. Scalp psoriasis, despite being partially hidden by the hair is often a source of social embarrassment due to flaking of the scale and severe 'dandruff'. 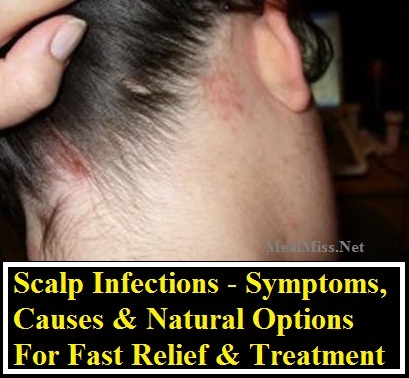 Scalp psoriasis may be extremely itchy or on occasion have no itch symptoms. It can also cause temporary baldness on the affected areas. It is a common, chronic, inflammatory skin disease and is associated with increased risk of melanoma, squamous cell carcinoma, and basal cell carcinoma. Folliculitis of the scalp is a superficial bacterial infection of the hair follicles. It is characterized by pustules around the hair follicles and symptoms include painful brushing of hair and tenderness when rubbing your scalp around the hair follicle sites. Treating with antibiotics for the particular bacteria is the usual course of action but can eventually cause resistance to the antibiotic used. Options include applying Evoclin Foam which is topical. Folliculitis is commonly caused by staph bacteria which also reside inside the nose and sinus cavity. Natural oils such as tea tree and lavender have good antibacterial properties and can also be used to treat this condition. If you have a bump or lump under the skin (commonly a lump behind the ears with no broken skin or rash developing, then this could be a cyst. Cysts are liquid filled pustules which can be painful when they become infected. If you have such symptoms I recommend seeing a doctor to be safe. Doctors can also treat cysts with antibiotics if they have become infected or incise them as a further but uncommon procedure if the antibiotics are not sufficient. Stress Related Itching Stress can contribute to or worsen scalp itching as it plays havoc with our immune system and hormones which have an effect on production of sebum from your sebaceous glands. Although it can contribute to the problem it is still somewhat of a myth. It may appear that you have a"stress rash", but it is more likely that the problem was already there in a less noticeable way, then aggravated by increased stress levels making it harder for your body to deal with the problem on its own and eliminate the problem. Many of the treatments below include stress relieving properties - like Lavender oil for example which calms the mind and soothes the body. Going to your doctor may be the best way to get an accurate answer to diagnosing your problem, but I understand that many of you may have already done this, been prescribed some form of medication of cream (even "heavy duty" cortisone based ones where the cortisone potency may need to be increased after time). Often the problem either doesn't go away from the start - or seems to subside but comes back with full a vengeance later leaving you wondering with more unanswered questions and a VERY unhappy scalp! Well the good news is if you don't like using these expensive and often impotent products- or even want to help them along you can use natural remedies and essential oils known to be super effective anti-bacterial busters such as tea tree oil for instance to inhibit or stop the growth of the infection and assist healing/re balancing of the scalp. Something that is also important to understand in curing scalp conditions and scalp infections - a factor that is missed by so many doctors, and something not disclosed by companies who sell hair products and treatments is the number of people who are allergic or sensitive to commonly used ingredients in shampoos, dandruff treatments and other hair products. In fact MOST hair products (as many as 90%) contain at least one ingredient that is used in engine degreasers, another is a common ingredient in antifreeze. These ingredients are cheap to produce foaming agents that make shampoo foam up, and do a fantastic job of stripping dirt and oily build up from hair. Problem is that they sometimes do SUCH a good job that they remove all of the natural oils and sebum from the scalp thus removing the scalps natural against bacteria etc. Another little known fact is that the most common ingredient (Sodium laureth sulphate) is used to induce skin irritation in test patients by drug companies to test the effectiveness of their itch relief skin creams. When first produced and for year's afterwards manufacturers did not know that skin was not a barrier but an absorber of ingredients & that they caused skin irritation in so many people. So sometimes the beginning of a scalp condition can have originated from something as simple as an imbalance to the skins (scalps) sebum or an allergy to an ingredient that can easily be rectified. Like your immune system, if your skin has an opportunity to rebalance itself and not be subjected to "incoming foreign matter" and the daily stripping of its natural oils that further aggravates the problem you can allow your body to re balance and heal itself. Obviously buying products that do not strip your hair and scalp is an obvious step in the right direction. Fortunately there are a lot of manufacturers such as Aveda and Akin (Purist Company) who know what consumers are suffering from these issues so have addressed this problem. They have applied this knowledge to produce some amazing products with all of the benefits of natural ingredients, with none of the side effects at a price we can afford (Akin especially). It need not be difficult, nor expensive to make these choices and a move to healthy hair and scalp long term. So yes you can eliminate harsh shampoos containing sodium sulphates and go for natural Sulphate and paraben free shampoos that contain ingredients such as macadamia, wheat germ or jojoba oils. These oils mimic our natural sebum to some extent to help to re moisturize and nourish our scalp. Then there are lavender, rosemary and tea tree oils which contain antibacterial, healing properties. Neem oil great for its antiquing and stops itching. You can apply these topically to your skin for fast relief, to assist healing as well as looking out for shampoos with these natural ingredients in them. Lavender calms the skin (as does chamomile tea cooled and used as hair rinse). create your own combinations of remedy or remedies to soothe your scalp. water (4 parts water 1part oil) and spray onto scalp and you can add to your shampoo and conditioners also). (Mixed together and dabbed locally on effected areas has a soothing effect). Neem oil is also a very good dandruff preventative which can be added to any of the formulas detailed below and is excellent for psoriasis and eczema & scalp infections. follicles by chemicals in shampoos causing thinning hair. (Lavender is known to stimulate hair growth too). There are many more powerful scalp remedies you can use to treat your scalp as well as many shampoos that are excellent value, contain no nasties to aggravate your scalp and hair follicles. It can be really simple to treat scalp problems by treating yourself to your own pampering session using natural oils to help heal your scalp infection. And then be kind to your hair and scalp by using only products that nourish your hair and scalp such as Aveda or Akin brand shampoos. You can assist the healing process and help restore balance back to your scalp and you hair will appreciate and reward you for it too by becoming less brittle, stronger and shinier. As with all natural remedies please patch test first. It is not intended for this information to replace a doctors medical advice, so please see your doctor for diagnosis and treatment. The responsibility of obtaining doctors diagnosis and using remedies is yours.